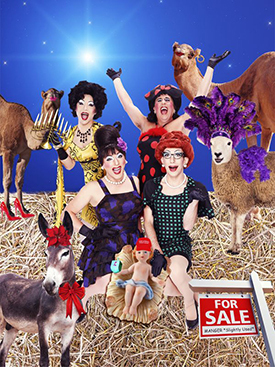 In Oy Vey in a Manger, we find Rachel, Winnie, Trixie, and Trampolina trying to sell off their manger--yes, that manger--before it's foreclosed upon. Crises arise, secrets are revealed, Jewish-Gentile tensions surface, and mayhem ensues--all in glorious four-part harmony. Oy Vey boasts The Kinsey Sicks reinterpretations of holiday classics, such as "God Bless Ye Femmy Lesbians," "Satan Baby", and "I'm Dreaming of a Vanna White Christmas", plus hilarious Jewish satiric fare, including "Don't Be Happy, Worry," the Chanukah spa classic "I Had a Little Facial" and, of course, the requisite and new Christmas cuisine standard, "Soylent Night."